The shoulders are the most common joint in the body to dislocate. The arm is moved away from the body (abducted) and externally rotated (turning the forearm, palm side up). The joint gives way, and the humeral head, or the ball of the joint, is ripped out of the socket. The structures that hold the shoulder together are torn, including the joint capsule, cartilage, and the ligaments of the rotator cuff. People with this injury appear in the ER in a fair amount of pain, and pain control is the first priority. The usual sequence of events begins with drugs to help with the pain, a quick exam by the doctor, followed by x-raysto make sure no bones are broken. Then the dislocated shoulder can be reduced; and most people prefer to be aggressively sedated for the procedure. If your shoulder is wrenched upward and backward, you may dislocate it out of its socket. This condition is both painful and incapacitating. The force required is often that of a fall or a collision with another person or object (both of which can occur during many sports). Most shoulder dislocations happen at the lower front of the shoulder, because of the particular anatomy of the shoulder joint. The bones of the shoulder are the socket of the shoulder blade (scapula) and the ball at the upper end of the arm bone (humerus). The socket on the shoulder blade is fairly shallow, but a lip or rim ofcartilage makes it deeper. The joint is supported on all sides by ligaments called the joint capsule, and the whole thing is covered by the rotator cuff. The rotator cuff is made up of four tendons attached to muscles that start on the scapula and end on the upper humerus. They reinforce the shoulder joint from above, in front, and in back, which makes the weakest point in the rotator cuff in the lower front. Subluxation refers to a partial dislocation. A subluxation occurs when the two joint (articular) surfaces have lost their usual contact. A 50% subluxation means the normally opposing articular surfaces have lost half their usual contact and the joint is partially dislocated. A 100% subluxation means the articular surfaces have lost all of their contact. A dislocation is the same as a 100% subluxation. The shoulder joint is the body's most mobile joint. It can turn in many directions. But, this advantage also makes the shoulder an easy joint to dislocate. Sometimes dislocation may tear ligaments or tendons in the shoulder or damage nerves. 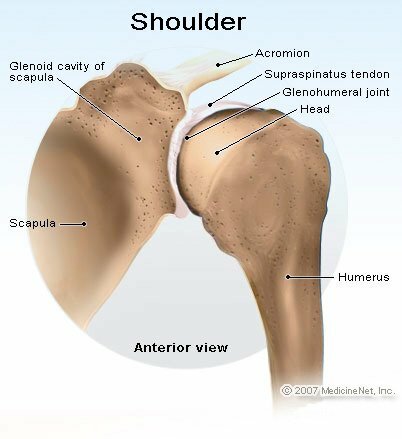 The shoulder joint can dislocate forward, backward, or downward. A common type of shoulder dislocation is when the shoulder slips forward (anterior instability). This means the upper arm bone moved forward and down out of its joint. It may happen when the arm is put in a throwing position. The muscles may have spasms from the disruption, and this can make it hurt more. When the shoulder dislocates time and again, there is shoulder instability. The doctor will examine the shoulder and may order an X-ray. It is important that the doctor know how the dislocation happened and whether the shoulder had ever been dislocated before. The doctor will place the ball of the upper arm bone (humerus) back into the joint socket. This process is called closed reduction. Severe pain stops almost immediately once the shoulder joint is back in place. Many successful techniques for relocating a dislocated shoulder are available. A doctor may need to try more than one technique on the patient before a method is found that suits the particular dislocation. The technique may also vary if the dislocation is not the usual inferior type. After the patient's shoulder is back in place, they will be sent home in a sling or shoulder immobilizer (a sling-like device that attaches to the body to lessen movement at the shoulder joint). A pain reliever is often needed to control pain. Your doctor may immobilize the shoulder in a sling or other device for several weeks following treatment. Plenty of rest is needed. The sore area can be iced 3 to 4 times a day. After the pain and swelling go down, the doctor will prescribe rehabilitation exercises for you. These help restore the shoulder's range of motion and strengthen the muscles. Rehabilitation may also help prevent dislocating the shoulder again in the future. Rehabilitation will begin with gentle muscle toning exercises. Later, weight training can be added. The patient should an orthopedic doctor for a follow-up examination within a few days. Pain relieving medications may be modified and the joint examined to see that relocation has been maintained. The doctor may reexamine for injury to structures damaged by the originaltrauma. After a period of immobilization (usually a few weeks), slowly and gradually begin to increase the range of motion at the shoulder joint. This helps to preserve natural movement and lessen the risk of recurrent dislocation. When good progress is made with range of motion, strengthening exercises may be added to help the patient return to full function. Good follow-up care is basic in preventing dislocation again and healing damaged tissues. Even with the best care, however, dislocation can reoccur. About 90% of people who experience shoulder dislocations when younger than 20 years of age go on to experience a second dislocation. After age 40, 14% have a second dislocation. If a dislocation occurs a second time in the same shoulder, especially with less trauma, the patient should be evaluated for the possibility of ligament damage in their shoulder. If this is the case, the patient may need surgery to prevent recurrent shoulder dislocations. Surgical repair and reconstruction by Open method is preferred over Arthroscopic surgery for strong shoulder. Why is the shoulder joint more prone to re-dislocation (recurrent dislocation)? The shoulder is a potentially unstable joint due the head of the humerus (ball) having a wider circumference than the socket (glenoid) which is also shallow. The stability of the shoulder is therefore dependent on the adjoining soft tissues like the labrum, capsule and the ligaments. 1. disruption of the labrum, capsule and the ligaments in the front of the shoulder. This is known as the Bankart’s lesion. 2. The head of the humerus (ball) comes to lie over the front edge of the glenoid (socket) and this causes an indentation on the ball. This is known as the Hill-Sach’s lesion. In a proportion of patients the Bankart Bankart’s lesion does not heal completely causing the joint to be unstable and vulnerable to further dislocation with lesser injury (trivial trauma) trivial or no injury. It is now well known has been shown that the younger the patient at the time of first dislocation (age less than 25 years), higher is the chance of a re-dislocation. The chance of shoulder re-dislocating after the first dislocation can be as high as 70-90% in a young patient (below 25 yrs of age). With each dislocation the capsule in the front gets stretched and thinned out making further dislocations to happen occur with relative ease. On the other hand, in In patients with an inherent laxity of the joint capsule, the joint is capacious (lax) and is easily dislocated with trivial injury or during activities like throwing or wearing a shirt. How do you diagnose shoulder instability? Shoulder instability is diagnosed on the basis of patient’s symptoms and physical examination. Shoulder instability could present with history of repeated episodes frank dislocations or as episodes of subluxations (partial dislocations) causing pain or discomfort. A patient with recurrent dislocating tendency may have suffered a dislocation after an injury, following which repeated dislocations occur with relative ease (without any significant injury).present with a history of more than one episode of dislocation (usually a few) occurring following an episode of “first dislocation” occurring after a significant injury with subsequent dislocations occurring “with ease”. Most of these patients are able to reduce (put back the dislocated shoulder) on their own or with some assistance. Patients with repeated episodes of subluxations will present Some patients may present with pain or discomfort while moving the shoulder without an obvious dislocation. This is due to the shoulder being subluxed (partially dislocated) instead of a complete dislocation. This usually occurs in the throwing position (abduction and external rotation of the arm) in athletes or while doing activities of daily living like putting on a shirt or lifting a heavy object. Physical examination will reveal an otherwise normal shoulder. The only positive finding is the ‘apprehension test’. In this test the arm is put in the vulnerable position of abduction and external position. This will cause pain or discomfort and the patient becomes apprehensive that the shoulder will re-dislocate. In patients with ligament laxity, episodes of dislocation or subluxation will occur without any significant injury. Further, since they have generalized ligament laxity, they may present with symptoms in both shoulders (bilateral dislocations or subluxations). Also these patients may exhibit evidence of laxity (loose-jointed) in the form of repeated patellar (knee cap) dislocations or hyper-extended knees. These patients will also have a positive ‘apprehension test’ on examination. Are there any tests which help in diagnosis a patient with shoulder instability? There are certain tests which may be performed to gain further information and plan out the treatment. 1. Plain X-rays: These are helpful only in patients with a frank dislocation where it demonstrates the presence of a dislocated head. In cases with recurrent dislocation certain special views will demonstrate the Hill-Sach’s lesion (indentation at the back of the head). Otherwise X-rays are not of much value. 2. MRI / MR Arthrography: This will clearly demonstrate the Bankart lesion (which is diagnostic of a recurrent dislocation) as well as the Hill-Sach lesion. In patients with ligament laxity, arthrography reveals a very capacious joint with a lax capsule. 3. CT / CT arthrography: This is very useful in demonstrating any bone loss in the glenoid socket. The amount of bone loss in the glenoid will dictate the type of surgical procedure to be performed. What is treatment of a ‘First-time dislocation’ of the shoulder? When a shoulder dislocates it must be promptly relocated by closed reduction (manipulating the shoulder without the need for open surgery). This may require a general anaesthetic or some form of sedation. Once the shoulder is relocated, the arm is immobilized by the side of the chest using a shoulder immobilizer type of sling for a period of 3-6 weeks. In very young patients (below the age of 25 years) and high demand athletes, there may be a case need for surgery (Bankart repair) immediately after the first dislocation to prevent the chance of further dislocations as the incidence of recurrent dislocation in these patients is very high. What is treatment of recurrent dislocation or instability of the shoulder? The treatment options for repeated shoulder dislocations depend on the functional demands of the patient and the level of disability suffered by the patient due to these episodes of instability. 1) Conservative (Non-surgical) treatment - Every patient with shoulder instability may not require surgery. Those patients who have a sedentary life-style and those who are not involved in strenuous activities or active sports may be able to manage without surgery as long as they are able to restrict activities which are likely to cause a dislocation or subluxation. However, there is an ever present risk of dislocation or symptomatic instability occurring at any point in time if the shoulder is placed in a vulnerable position. The advantage of the arthroscopic technique is its minimally invasive nature which minimizes morbidity of surgery and hospital stay. Disadvantage is of inadequate repair and recurrence of problem are more common. The Bankart repair and capsular shift is can also be performed by open surgery which involves making a cut of about 3-5 cm. over the front of the shoulder. This procedure also involves cutting through the subscapularis muscle which needs to be repaired at the end of the procedure. In cases where there is significant bone loss in the glenoid or a large Hill-Sach’s lesion (engaging Hill-Sach’s), a Bankart repair alone is likely to fail. In such situations a Bristow-Latarjet procedure (transfer of coracoid process to the glenoid defect) or a bone graft to the Hill-Sach’s lesion needs to be performed. These procedures require an open operation. The patient may leave the hospital after 2-3 days after open surgery. The arm is placed in a shoulder immobilizer type of sling which restricts movement of the arm upwards, outwards and outward rotation of the arm. Depending upon the type of surgery performed and the strength of the repair achieved, the arm will be immobilized in the sling for a period of 3- 6 weeks. At around 2-3 weeks after surgery, pendulum exercises (gravity assisted movements of the arm) are initiated. At around 6 weeks after surgery, full range-of-motion exercises as well as shoulder strengthening exercises are started. When can one return to routine activities and sporting activities? Overall it will take around 2-3 months after surgery for any patient to return to pre-operation status as far routine day-to-day activities are concerned. It may take around 6-12 months for a recreational athlete to return to sports, and even longer for a professional athlete (depending upon the nature of sport and the level of competition involved). 1. The pathology comprises two important elements: (a) anterior detachment of the glenoid labrum from the bone margin of the glenoid, associated with some degree of stripping of the anterior part of the capsule from the front of the neck of the scapula, found in 87 per cent. of cases examined adequately at operation; (b) defect or flattening of the posterolateral aspect of the articular surface of the head of the humerus which engages with the glenoid cavity when the arm is in external rotation and abduction; this defect is demonstrated most readily in antero-posterior radiographs taken with the humerus in 60 to 70 degrees of internal rotation and was shown to be present in 82 per cent. of cases which had been subjected to adequate radiographic examination. 2. The frequency of the humeral head defect has been under-estimated in the past, because of the difficulty of demonstrating it, particularly when the defect is small. 3. Either type of lesion alone may predispose to recurrence of the dislocation. 4. Both types of lesion are often present in the same shoulder. When this is the case the tendency to redislocation is great. 5. The initial dislocation, which results in the development of one or both these persistent structural abnormalities, may be due to very different types of injury, the commonest of which is a fall on the outstretched hand. The factor common to all these injuries is a resultant force acting on the humeral head in the direction of the anterior glenoid margin. 6. In the treatment of recurrent dislocation of the shoulder joint the Nicola operation is unreliable, and it may be associated with a recurrence rate as high as 36 per cent. It is believed that continued instability after this operation is usually due to the presence of a defect of the humeral head. 7. Operative treatment should aim at repairing, or nullifying, the effects of both types of lesion. For anterior detachment of the labrum this involves either suturing the labrum back to the glenoid margin, or constructing some form of anterior buttress, fibrous or bony: for humeral head defects it necessitates some procedure designed to limit external rotation, thus preventing the defect from coming into engagement with the glenoid cavity. Such limitation of external rotation does not constitute a significant disability.